Owning a pet dog is a memorable and enjoyable experience for every family. We cannot deny the fact that dogs bring companionship and utter joy to families everywhere; we even treat the dogs as if it were our own kind and our family member. Excessive barking is a sign of territorial aggression; you might find your dog barking and snapping at strangers approaching your campsite. Sometimes it’s a sign of stress; walk around the area with your dog to familiarize him with his surroundings. Outdoor camping with pets means eating outside, where your dog can freely beg for food. Prior to meal time, make sure your four-legged friend has his own share of food and feed him well. On the other hand, you can tie him away from the table to avoid your dog from wandering off. Dogs respond to their own instinct—so when nature calls, they’ll heed. It’s good if you had your dog “potty-trained”, but it can be very unpleasant if they leave land mines around the campsite. Be prepared with plastic bags and your own pooper scooper. There are some dog-friendly camping sites and they have areas where you can properly dispose waste. It’s within a dog’s nature to be protective with their family; you might want to initiate safety precautions especially if your dog is the protective type. Your dog might misunderstand the boisterous behavior of laughing, meeting new people and unpredictable personalities as a threat. Inform people and keep watch over your dog as it interacts and responds to your guests. Meanwhile, you can tie them on a leash or put a muzzle on your pet. Leaving your dog unattended is a big no-no. A lot of things can happen to your pet when it’s not under your supervision. It may become aggressive, destroy property, attack other animals or even people. Moreover, if you’re thinking of leaving your pet in your car or Recreational Vehicle (RV) with the air conditioning or a fan on, they could die due to carbon monoxide poisoning, dehydration, or excessive heat. Arrange to have someone oversee your best buddy before you leave him, or if it’s possible, take them with you for exercise. It may even tire them out which will make your evening more calm. 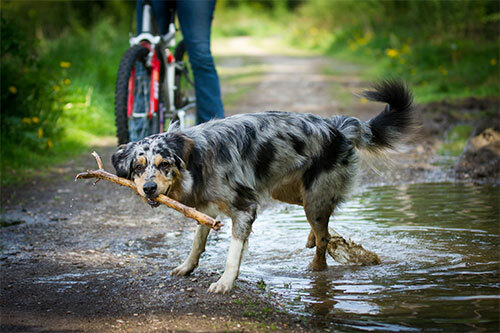 However, if your four-legged friend cannot be controlled easily due to lack of training, you can still enjoy your camping trip— you can leave your pet at home or at a pet boarding center. That way, you’ll ensure the safety of your pet as well as the others. Enjoy the adventure!